Anthony Joshua Ready to Challenge Joseph Parker ! On March 31, nearly 70,000 people will attend the fight between Britain’s Anthony Joshua and New Zealand’s Joseph Parker. Pickssoccer.com preview for Anthony Joshua vs Joseph Parker ! Organised at Cardiff’s Principality Stadium, the stakes are high since the belts of the two boxers are put back into play. Announced as the favourite by the boxing sites, Joshua will nevertheless be wary of his opponent determined to put him on the floor. Anthony Joshua – born October 15, 1989 (27 years old) in Watford, Hertfordshire, England. His career record – 20 fights – 20 wins (20 early wins by knockout) and no defeats. In total, he spent 65 rounds in a professional ring. Height – 198 cm, weight – over 90 kg. “Nickname” – AJ. Anthony Joshua – undefeated British professional boxer, performing in a heavyweight division. Olympic champion of the 2012 Olympics in the weight category over 91 kg. He is the IBF World Heavyweight Champion in 2016, the winner of the British champion title in 2015 and champion of the Commonwealth in 2015. The most promising boxer of 2014 according to the magazine “The Ring”. The first heavyweight player in the history of boxing, he won the professional championship title, being the current Olympic heavyweight champion. The holder of IBF, IBO, WBA, WBC International, British, Commonwealth (British Empire) titles. • In 2009, he won the Haringey Cup in boxing in the heavyweight division. • In May 2010 he became the champion of England among amateurs according to ABAE, in the heavyweight division. • In 2011 he met the future silver medalist of the Olympic Games Joseph Joyce. Joshua won by a knockout in the 1st round. • In 2011, he retained his ABAE title and entered the quarterfinals of the European Championship, losing by a technical knockout in the 3rd round to the Romanian Mihai Nistor. • In 2011, he took part in the World Championship in Baku, where he won a silver medal. • In 2012, he took part in the Olympic Games in London, where he reached the final in the weight category over 91 kg. In the final in a fight against Italian Roberto Cammarelele, the boxers scored 18 points and by decision of the judges the victory was awarded to the British. He made his professional debut on October 5, 2013. Anthony had the first 6 fights with little-known boxers, having won all the fights with a knockout victory in the early rounds. On the professional circuit, he has a record of 20 victories by knockout for as many battles fought. Joshua Rivals : His significant rivals in the boxing professional ring were such boxers as: Carlos Takam (35-3-1) (October 28, 2017) – victory, Wladimir Klitschko (64-4) (April 29, 2017) – victory – Unification bout for vacant world champion titles – version of the WBA Super, IBO and defense of the world title under the IBF (3rd defense of Joshua). Joshua, for the first time in his career, was down in the 6th round. Klitschko was knocked down in round 5 and twice in the 11th round. Score: 96-93, 93-95, 95-93, Charles Martin (23-0-1) (April 9, 2016) – victory, Gary Cornish (21-0) (September 12, 2015) – victory – He won the vacant title The British Commonwealth of Nations (Commonwealth) and defended the title of champion by the version of WBC International. 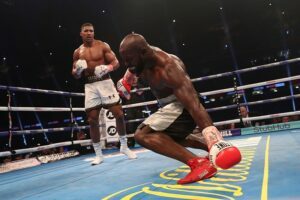 Last fight : Joshua vs Takam – His last fight was with Carlos Takam on October 28, 2017. After the fight with Wladimir Klitschko, the IBF decided that by the end of August of the same year the British Anthony Joshua would have to defend his belt in a duel with official challenger Kubrat Pulev (25-1, 13 KOs). However, Joshua preferred the option of revenge with Wladimir Klitschko and the IBF agreed to grant him a reprieve, but on August 3, 2017, Wladimir Klitschko announced his retirement, and so it was decided to fight with Pulev. However, shortly before the fight, Polev was injured and Carlos Takam became the next mandatory contender and opponent of Joshua. The fight took place in Cardiff at the Millennium Stadium, which seats 70,000 spectators. In this battle, a world record was set for selling tickets for boxing shows. According to The Telegraph, in one day fans bought out almost all the seats at Principality Stadium in Cardiff (Wales) – 70 thousand. Joshua’s fee was 20 million dollars, and Takama’s 5, which became the largest fees for both boxers. Joshua dominated throughout the battle. In the 4th round, he sent Takam to the ground. Although wounded, Takam counterattacked. In the 10th round, Anthony staggered Takam with a series of head shots but Takam did not go down. The referee stopped the fight. The decision was controversial. Many, including Joshua, found the stoppage premature. Takam referred to the premature stopping of the fight and the catastrophic lack of time required for preparation. Thanks to this invincibility, he is now tackling his fight against Parker with the WBA, IBF and IBO belts. His record makes Joshua the big favourite for all box sports betting. Joseph Parker is a New Zealand professional boxer performing in the heavyweight category (over 90.7 kg). Heavyweight World Champion according to WBO 2016. Heavyweight champion of Asia according to PABA 2014-2015; OPBF 2015-2016. New Zealand heavyweight champion in 2013. Winner of WBO World, WBO Oriental, WBA Oceania, WBC Eurasia Pacific, WBO Africa, OPBF, PABA titles. Joseph Parker took up boxing at the age of eleven. Parker was successful in an amateur career, winning gold at the country’s heavyweight championship in 2010, 2011 and 2012 and winning several international tournaments. The peak of his career came in 18 years, when he won silver in 2010 at the Summer Youth Olympic Games in Singapore and bronze at the World Junior Championships in Baku. Parker’s professional career began in July 2012. His significant rivals were such boxers as: Huey Fury (20-0) (September 23, 2017) – victory, Andy Ruiz (29-0) (December 10, 2016) – victory – He won the vacant WBO heavyweight title, Alexander Dimitrenko (38-2) (October 1, 2016) (May 21, 2016) – victory, Carlos Takam (33-2-1) – victory. His last fight was with Huey Fury, on September 23, 2017. Fury relied on mobility and a jab, with which he kept Parker at a distance. Parker tried to reduce the distance, but he was not always successful in that, simply following the rival, but not cutting off the path for retreat. No knockdowns, not even significant hits (the audience did not see anything), but the judges preferred the aggression of Parker: 114-114, 118-110 and 118-110 – the victory of the current champion by a majority of the judges. The New Zealander Joseph Parker approaches the fight with the status of outsider. 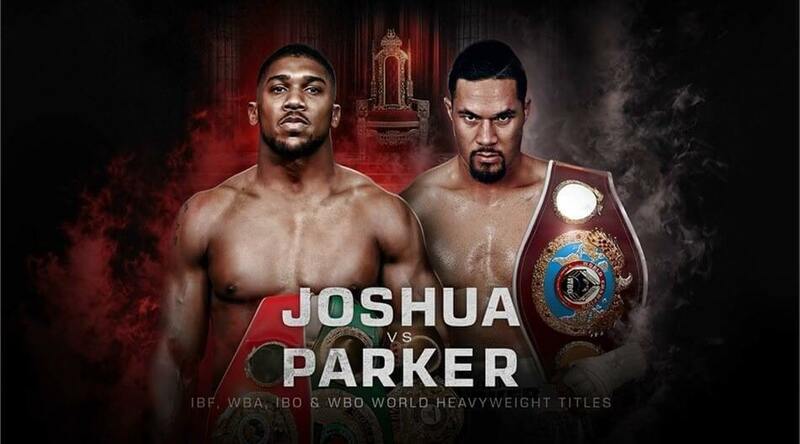 With 24 victories (including 18 by KO) for 24 fights led, Parker appears anyway as a serious competitor for Joshua. Boxer fees for the fight: The British boxer will receive 20.3 million dollars, while his rival, Parker – 9.5 million. Both boxers in the recent past had one common rival – Carlos Takam, who lost to both of them. Joseph Parker defeated the Cameroonian Carlos Takam (May 21, 2016) by judges’ decision (account of the judges’ notes 116-112, 116-112, 115-113). Joshua, in the fight with Takam (October 28, 2017), dominated the whole fight. In the 4th round, he sent Takam to the ground. And in the 10th round the referee stopped the fight – TKO 10. For several weeks, a psychological war between the two camps has started via social networks and interviews in the media. In an interview with the Telegraph, Parker showed his willingness to “chop the glass-chested man” To this, he adds: “If I win, for me it will be anything but a shock. I think my time has come and I will arrive in the ring confident in my abilities“. In addition, his outsider position allows him to put the pressure and the stake of the fight on his opponent: “I sincerely think I can knock him out and there is no pressure when I’m in my position because nothing is expected from me“. To annoy Joshua a little more, the Parker camp launched, in half-words, accusations of doping. Indeed, in one of these statements, Parker said he prefers to call his opponent “King of Steroids” rather than “King of Pies”. The response to this new provocation did not take long to come. Faced with these accusations, Joshua preferred to ignore them: “Can I sue him? I know my records are clean. That’s why I don’t bite at it. I’ve heard so much in boxing trash talk that nothing’s new anymore“. Unlike his opponent, Joshua preferred to display serenity and total confidence in himself. In these statements, Joshua says, “It will take more than a human to stop me going where I’m destined to be. I do not want to go too far because with fatigue you can never know, but I move with confidence” In front of Parker, Anthony Joshua approaches this duel with confidence and determination. On January 16, 2018, at the press conference announcing the fight, the two boxers met face to face. Contrary to the replies by intermediary media, the exchange between the two men was relatively cordial. Indeed, despite the motivation displayed by each, the two boxers showed a certain mutual respect. To bet on this boxing fight, the bookies show odds in favour of Joshua’s victory. Indeed, the average odds are 1.5 to 7 for the victory of Parker. Given his performance and confidence, Anthony Joshua appears as the grand favourite for this fight. He will smash Parker in 5 rounds ! Joshua wins TKO in round 6, how about that?